Recently I’ve noticed how often people misuse the word “notoriety.” As in the following, from advertising for a construction company: “Erecting the steel on each these projects in a safe and efficient manner brought them notoriety on a national level.” I certainly hope not. Notoriety is specifically negative attention. Notorious construction usually leads to protracted litigation, and that’s not the kind of attention you want to bring to your enterprise. Which brings me to the subject of Gurkha cigars, a brand of great “notoriety.” Utter the word “Gurkha” in a room of seasoned cigar smokers and inevitably the muffled laughter and condescending remarks will follow. When a company sells a single cigar for $825 (the cognac-infused Gurkha HMR) this is to be expected. But Gurkha as a company has in fact been enormously successful and has continuously increased production. The company recently expanded its corporate headquarters, moving them from Miami to Ft. Lauderdale, and currently produces cigars in five factories in Nicaragua and the Dominican Republic. If that’s “notoriety,” I guess they’ll take it. 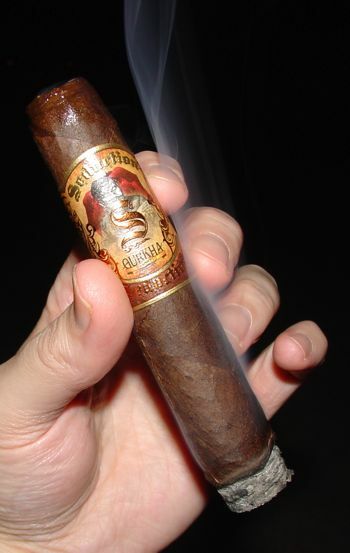 Gurkha’s Seduction blend was released last year, along side the company’s other newcomers, Cellar Reserve and Royal Challenge. Seduction is made at the Cuevas factory in the Dominican Republic, and features an unusual three country blend. The wrapper is a dark Ecuadorian Habano, beneath which is a Dominican Olor binder. The filler is entirely Colombian Corojo. 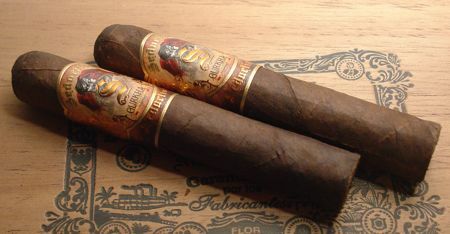 The Seduction is not a maduro cigar, but the Ecuadorian Habano leaf that covers the cigar is consistently maduro in color. The wrapper is rough and slightly dry, and it smells like an abandoned barn. The roll is solid, and the cap is rounded and cuts cleanly. I’ve smoked a handful of these now and every one has been packed well and has drawn perfectly. The burn is mostly even. A couple cigars have shown rebellious tendencies, but these have been easily corrected. But the aged Seduction is a much mellower cigar, opening with rich billows of chocolate and muted cedar. The smoke is aromatic, but too heavy to convey much subtlety. 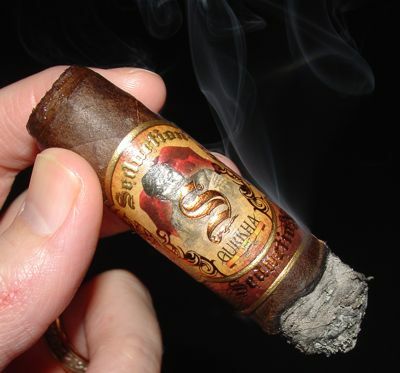 The cigar produces a prodigious amount of smoke and burns slowly. I put the cigar down for about ten minutes to do something in the house and fully expected having to re-light on my return. But the half-smoked Seduction was still smoldering. By the mid-point of the cigar the flavors meld into a pleasant but mundane blend of dry wood and coffee, and from there it’s a casual coast to the finish line. Gurkha may not have hit the ball out of the park with this one, but it’s a solid double. I really enjoy the fact that this is a full-bodied cigar that is only mild to medium in strength, so it can be smoked at pretty much any time of day. The cigar is also veritable smoke machine. You could probably smoke a gopher out of its hole with this one, except the gopher might steal your cigar. Going price is around $7.00, and this is a retail exclusive. Try one now, and put one away for a few months.